Sometimes, Listening to your favorite music collection anywhere in your home used to involve overcoming some issues. You’d either need to move your music system from room to room or you need to move to another room, setup wires and cables trailing under doors and rugs and up the stairs, or you could spend a fortune on a custom-install system. But with the help of Sonos beam, You can now stream your music from a range of devices like smartphone, laptop, NAS drive to multiple speakers around the home using a wireless connection. The Sonos Beam is a powerful speaker for its size. 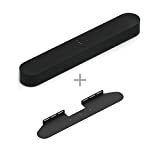 This isn’t simply a soundbar. It’s a wireless, multi-room speaker that can play music from almost any source. Spotify, Tidal, Apple Music, Amazon, Google Play, Deezer, your phone, network-connected hard drives – it’s all supported and all can be combined in on-the-fly playlists and queues. The Beam can be part of a Sonos multi-room audio system, but if you’d prefer to mix it with Apple AirPlay 2 components, Sonos will accommodate your desire on that score, too. 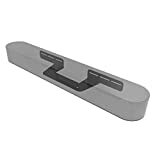 The Beam comes in black or white color, and it’s a remarkably compact thing — just a little over 2 feet long, 2.7 inches tall, and 3.94 inches deep. Around the back of the Beam sits a port that no other Sonos product has ever featured: HDMI. 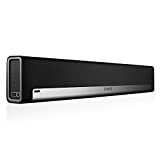 But it’s not part of a pass-through system that you see on most other soundbars; Sonos’s only interest in HDMI is what it lets the Beam do with voice commands. Then open the Sonos app on your phone to connect it to your WiFi. If you don’t have HDMI ARC on your TV, you can use the included optical adapter to get digital audio out of your TV’s optical-out port. Setting up the volume this way is a little more convoluted: you’ll have to manually disable your TV’s speakers, and then use the Sonos app to program the Beam to recognize your TV remote’s IR commands. Based in California, Sonos was founded in 2002 with one simple aim to transform your home sound system for the digital one. Its products and software are designed to ready every room of your home with music, and the flexibility and functionality of its products have made the company a household name. The Sonos Controller app (available on Android and iOS) will walk you through the set-up, but it requires little more than pressing the speaker’s sync button (to link them to your network and other Sonos speakers), finding the connected speaker on the app and entering details such as your wi-fi password. It’s really that easy and smooth, simple-to-use Controller app makes everyday use even easier. In the app, you can assign each speaker to a room of your house, programme it so the volume can be controlled via your TV’s standard remote, and add your favorite streaming services. The app recognizes which speaker you’re using, and in which room you’re using it. Listen to music, TV, movies, podcasts, radio, audiobooks and video games. Experience rich, detailed sound that fills the entire room. Thoughtfully designed for your home. 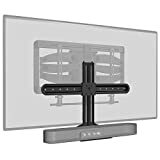 Place on your TV stand or wall mount. With software updates, your listening experience is always improving. Set-up is quick and easy. Download the Sonos app, connect Beam to power and your TV, then follow the app instructions. 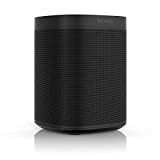 Connect Sonos speakers wirelessly to create a home sound system. Create a home theater system with a pair of rear speakers and a Sub. Play sound from your Apple devices to Sonos with AirPlay, and Ask Siri to play music all over your home. Controlling music with your voice is now almost commonplace. For this, thanks to smart devices like the Amazon Echo, Google Home, Apple HomePod, and of course the Sonos One. You can talk to the Beam from anywhere in the room, and you don’t need a physical remote to trigger it. The Beam also supports follow-up mode for back-to-back demands. Sonos Beam plays back all of your TV audio, once setup with the Sonos app is complete. You can stream audio from TV, movies, video on demand, music, radio, video games, audiobooks, and podcast. Sonos Beam has surprising sound for its size. Its soundstages are full, spacious and wider than the speaker itself, creating an immersive listening experience. Dialogue is clear. There’s adequate bass performance to enrich most listening experiences. Sonos Beam is a more compact speaker and can fit almost anywhere. 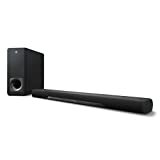 Playbar and Playbase produce a louder sound with more width and bass. Beam is optimized for small to mid-sized rooms, whereas Playbar and Playbase are capable of filling large spaces. Yes. While Sonos Beam is a great soundbar on its own, it also wirelessly pairs with our Sub for added bass and a pair of Play:1 speaker for full surround sound. A setup with left and right rears and a sub gives you true 5.1 surround sound. The Sonos Beam has a lot going for it. At the top of the list, there’s Alexa, which brings smart-speaker functions into your living room. 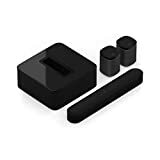 It delivers wide and fair sound overall, and you can also adjust the sound to your surroundings in ways that few soundbars allow. 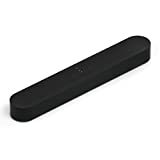 The soundbar’s small size can also be a reward, though, in return for the compact form, you give up the booming bass that other Sonos speakers create. Beam is the smart, compact soundbar for your TV with Amazon Alexa voice control. Beam is AirPlay 2 compatible with iOS devices. Seamlessly integrates Sonos Beam with mounted TVs. Allows Beam to move with full-motion TV mounts for an optimal listening experience. Intuitive Smart Latch provides 12" of tool-free height adjustment. 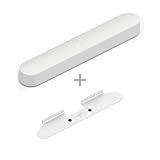 Get a clean, streamlined look between Beam and the bottom or your TV with just the lift of a finger. ⚠️ SPECIAL PRICE: Enjoy our lowest price ever this week ONLY! buy two or more packs and use the code SONOS100 and save 10% on a already great deal!